Have you ever thought you knew what you were looking at or listening to, only to find out later that it’s something else? It’s a very disorienting feeling—to be so sure of something your eyes or ears have told you, and then to discover the foundation you built your assumptions on isn’t solid, at all. This recently happened to me in our garden. We have a very tiny vegetable garden that utilizes pretty much the only spot on our property that can truly be considered “full sun.” There’s just enough room for a couple of pepper plants, four tomato plants, and some basil (all the herbs that aren’t quite as sun-greedy as basil are in another section of my perennial garden). After fighting relentlessly with tomato-eating squirrels in previous years, I began to realize the greedy rodents prefer big tomatoes to small ones, and red tomatoes to yellow or orange ones. I decided I wouldn’t bother planting big, red varieties any more. We could just buy them at the farmers market, to supplement our crop of sweet little golden fruits. This spring, I bought one Sun Gold plant, one Yellow Pear, one Green Zebra, and one tomatillo; I prepared the soil, planted the tomatoes, then began to water and tend to them, watching as they grew taller, produced flowers, and then began producing green fruit. The Sun Gold plant was in the lead. Just when I thought the little green tomatoes should start turning orange, they grew lighter green in color. And bigger. And bigger. Sun Golds are usually an inch in diameter, at most. These swelled to three inches, then four. And they weren’t turning golden in the least. Looking back on that moment, I’m completely fascinated by my initial reaction: There was clearly something wrong with those tomatoes—they were grotesque, an anomaly. Maybe they had a genetic disorder, or a disease! They were, after all, Sun Golds, yet they were behaving nothing like my mind told me Sun Golds should! Then one day, when I was out watering my well-behaved Yellow Pears and Green Zebras, my brain somehow opened up enough for a paradigm shift: Maybe that wasn’t a Sun Gold tomato plant! Maybe someone, at the greenhouse, stuck the wrong label into the pot! Of course, this must be what happened. And as soon as I realized it, those oversized, pale green tomatoes didn’t seem grotesque at all. I don’t know what variety they are, but the label doesn’t really matter. They are clearly tomatoes, and they’ll be tasty. (Unfortunately, they’ll also appeal to the squirrels, who will take a bite out of each one then leave the rest lying on the ground, mocking us—grrr!). So what can we do about it? For starters, we need to get out of the habit of jumping to conclusions. We need to gather information, ponder it, and store it away in our little mental files, without being so quick to get out the “CASE CLOSED” stamp. But does anyone have ideas about how to do that, other than just being more aware and honest with ourselves about that tendancy? Are there any scientists or investigators out there who can share with us how important it is to stay open to all the possibilities? Or do any of you have examples of times you’ve been too sure of what you know? it would a much better world if everyone employed the “there but for the grace of God go I” theory but sadly so many do not. since my divorce, I’ve learned to be a lot less judgmental and to work on trying to get where someone is coming from and figuring out what their “agenda” is. Not easy, took hours of therapy but it worked. I truly think the gov’t should pay for ppl to get counseling, hell knows we ALL need some. Oh boy, I have I experienced this! You mention not jumping to conclusions, but instead taking the time to gather information and consider it carefully. While this is obviously the best option, I think we don’t because we’re afraid of the possibility that we might be wrong. Being wrong about tomatoes wouldn’t be the end of the world, but being wrong about a person’s intentions or a strongly held conviction can be terrifying, so instead we cling to what we want to believe. In cases like these, I favor knowledge – whether it’s asking questions about something or someone we don’t know or going online to research tomato plants, trying to find that bit of knowledge that will help us understand what’s in front of our faces can make a world of difference. Interesting perspective – and I can add mine. My Dr’s hands are not like mine – she has 4 digits on one hand, 2 of which seem to be thumbs, and on the other hand are 4 short fingers and 1 thumb. When I first met this Dr., I noticed her hands and tried to adjust my perspective to focus on her intellect as a healer, and she is very knowledgeable. However my health issues are with my back and I faced a revelation when she was examining my back. I realized her hands are not just different from mine, but stronger. And she seems as nimble with her hands as anyone I know – and better than most. It is now hard for me to think of her hands as being a ‘disability’ since really it just seems she is ‘differently abled’ (although I know such phrases can seem trite. Enjoy your tomatoes. 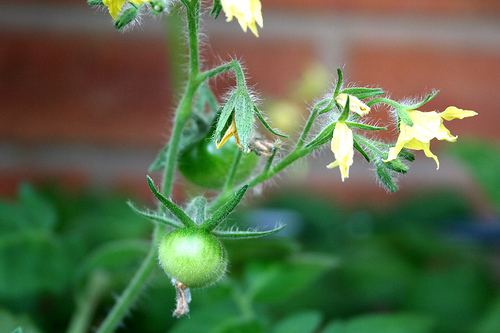 PS mosquito netting can work to keep squirrels off tomatoes. jessica, I can really relate to what you’re saying—since my divorce I’ve become much more open to people coming from different perspectives and experiences. I think it’s partly the result of therapy, but it also comes from knowing what it feels like to be judged and misunderstood by people who barely know you or your situation. It’s a crappy feeling—I try hard not to stir that feeling up in others. Meredith, isn’t it funny, in a way? Because I imagine we would both characterize ourselves as open-minded (and those who know us would probably say the same). Yet, we’re prone to getting stuck in our mindsets. Is it possible that our laziness is as much at fault as our fear? I like your “gather more knowledge” approach—it just requires that we pause and admit there’s probably more to know about a person or situation, and then take the time to find it. Eva, what a fascinating example! Often what we see is accurate—there is no doubt that your doctor’s hands are different from yours in the way you describe—but the conclusions we draw are completely unfounded. Btw, I like your “differently abled” phrase (and your squirrel advice!). Love this post, Kristin. I’ve been thinking a lot about the way we so quickly, easily and with so much “authority” label things, decide what they mean, etc. and not only that, the way we feel we NEED to. Don’t you think religion sets us up to “need” definite answers about things, black and white conclusions and absolutes that when we’re honest, just aren’t definite in our minds/hearts? Makes me think about that other garden. :) The one with the tree of the knowledge of good and evil. Whether you see that story as literal or myth, the truth remains: there is this human tendency to need to leave the “tree” as “the good one,” which automatically means the other person is “the bad one.” That other tree…the Tree of Life…is a place where we meet as equals…a place where we want to understand/be understood in a real way more than we want to be “right” or “good.” It’s a place where we see the tomatos in your garden for what they are, not what we expect them to be. Jason, at first I thought you were going to mention my squirrel conflict, then I saw you were headed somewhere much more important. :) And I think you’re exactly right—our extreme understanding of ourselves (our point of view, motivations, fears) ultimately alienates the other, magnifying our slight differences in the process. How, exactly, to push past that is tricky. One of my favorite things to do in my interactions with others is to ask lots of questions. Mostly I’m just curious, but I suppose it’s also another good way to suspend a tendency to jump to conclusions.